Some Paccar Engine Service Manuals PDF above the page. In 1905, in Seattle, Sir William Pigot created the company "Seattle Car Mfg Co." for the production of equipment for the maintenance of railways, as well as hoists for the timber industry. After a few years of "Seattle Car" merged with "Twohy Brothers" from Portland, and the new company is named "Pacific Car and Foundry Company", a name that will remain unchanged for 55 years. In 1924, William Pigott sells controlling stake in "American Car and Foundry Company". With the onset of the Great Depression, and the general economic downturn in 1929, the production technology is fully terminated and the business is waning. Paul Pigott, son of the founder, in 1934, bought the remaining assets of the company and equipment in "American Car". Under the leadership of the company Paul literally rises from the ashes and begin to produce powerful winches and hoists "Carco" for track-type tractors. 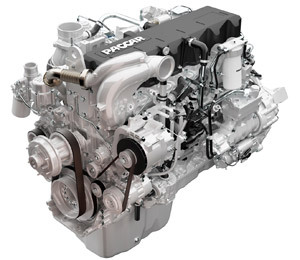 The first production was the basis for the subsequent development of the PACCAR Empire. Until today, at the plant has successfully operated a small assembly line for winches, sleeves, collars and planetary gears used in the timber industry. The plant is called PACCAR's Winch Division Renton there are production and integrates directly 3 small companies: "Braden", "Carco" and "Gearmatic". In 1941, America is entering into a world war. The company receives a large government order. The plant in Renton starts production of heavy tanks "Sherman" and emergency repair army vehicles. Throughout the war, "Pacific Car and Foundry" building a ship repair docks and tugs for the Navy. With the purchase of "Kenworth Motor Truck Company" in 1945, the company enters into the industry production of trucks and special-purpose machinery. Pacific Car and Foundry has significantly increased its production capacity and raised its stock rating immediately after the acquisition of the ownership of Peterbilt Motors Company in 1958. In the fall, Pacific Car manages to buy another well-known company - Dart Truck, producing dump trucks and trucks for work in the mines. In 1962, the opening of the world trade fair, one of the production units PACCAR titled "Structural Steel Division" has won the tender and by special order manufactured metal special strength for the construction of the TV tower in Seattle "Space Needle". Somewhat later, "Structural Steel Division" Perform the following order - delivered steel elements for the construction of the framework of the World Trade Center in New York. In 1960, PACCAR buys a number of factories outside the United States and become a transnational concern. A significant part of production lines Kenworth transferred to Mexico and soon formed a new division called "Kenworth Mexicana". In 1966, PACCAR is entering the fight for the Australian market and is building near Melbourne plant to assemble tractors 7-8 class. "PACCAR International" becomes responsible for the sale, warranty and post warranty maintenance of machinery outside the United States. PACCAR Parts Division, headquartered in Renton, for the supply of spare parts and aggregates all service centers and dealerships. In 1980 he produced PACCAR Leasing Corporation, responsible for the development of leasing schemes for the organization of delivery of equipment in long-term leases and working with dealerships. A year later, c buy truck manufacturer of the oldest in the world - the British company Foden, PACCAR Concern becoming an international manufacturer. PACCAR is investing tens of millions of dollars in the construction of the largest US service center Peterbilt and Kenworth car brands. In July 1982, put into operation a modern complex, located 65 miles north of Seattle. In 1987, PACCAR bought the company "Al's Auto Supply" in Washington, a major player in the automotive market and one of the largest wholesale center for the sale of commercial vehicles and car accessories. A year later, due to the purchase of another major wholesaler from California - "Grand Auto", PACCAR significantly strengthens the position of his unit PACCAR Automotive.